Kellytoy is expanding its delightful, award-winning and collectible Squishmallows “squad” ( www.squishmallows.com ) with the introduction of the new Squishmallows Baby line. The new babies are sure to please the ever-growing Squishmallows fan base that has been submitting ideas for new characters and styles at a feverish pace. 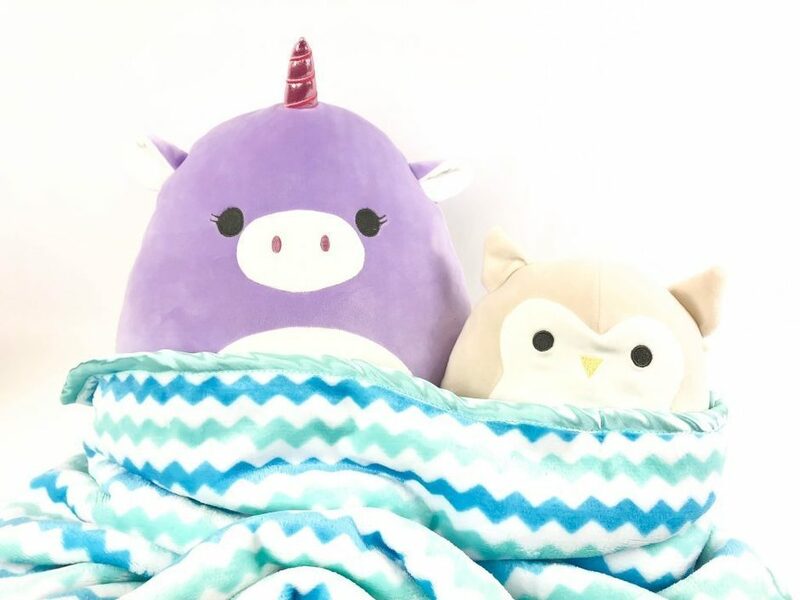 Squishmallows are a growing, international phenomenon with more than four million sold since their fall 2017 debut. 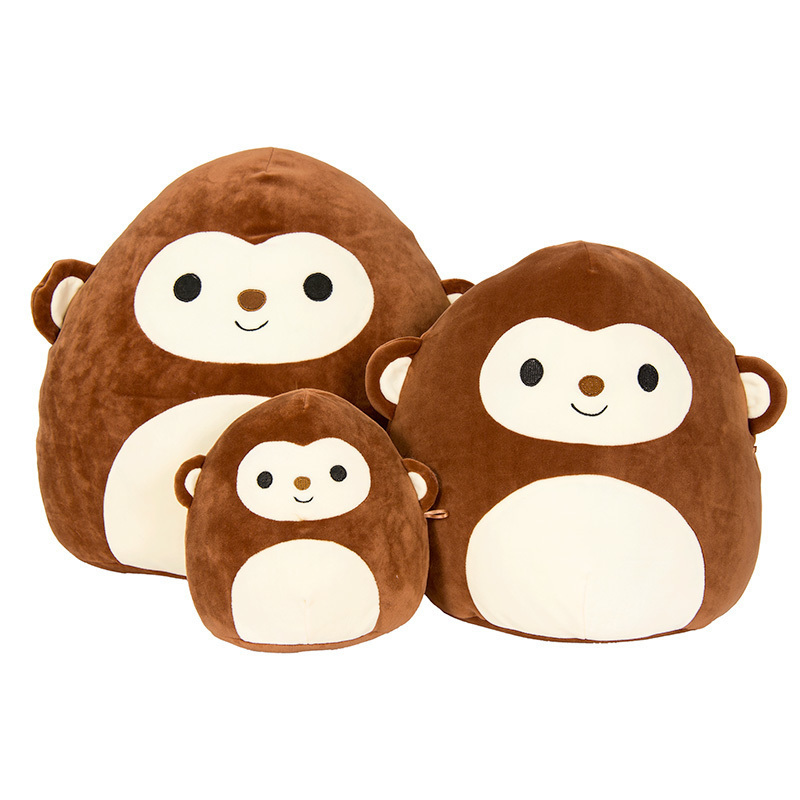 “The appealing ultra soft outer fabric and super squishy polyester stuffing is a snuggly alternative to high tech toys. Influenced by the Japanese ‘Kawaii’ look, Squishmallows have trended into a collectors delight,” says Kellytoy CEO Jonathan Kelly. The new Squishmallows Baby line will be available in nine styles—including owls, lambs, bunnies, a chick, elephant and unicorn. Featuring soft pastel colors, the line will be available in two sizes: small (8”) and medium (12”) with a suggested retail price of $9.99 and $19.99, respectively. The eight inch size makes a rattle sound when dropped or shaken. Like their grown-up brothers and sisters, these Squishmallows babies pop with personality. All characters have their unique background stories detailed on their hangtags and are made of super soft polyester with a marshmallow-like texture. 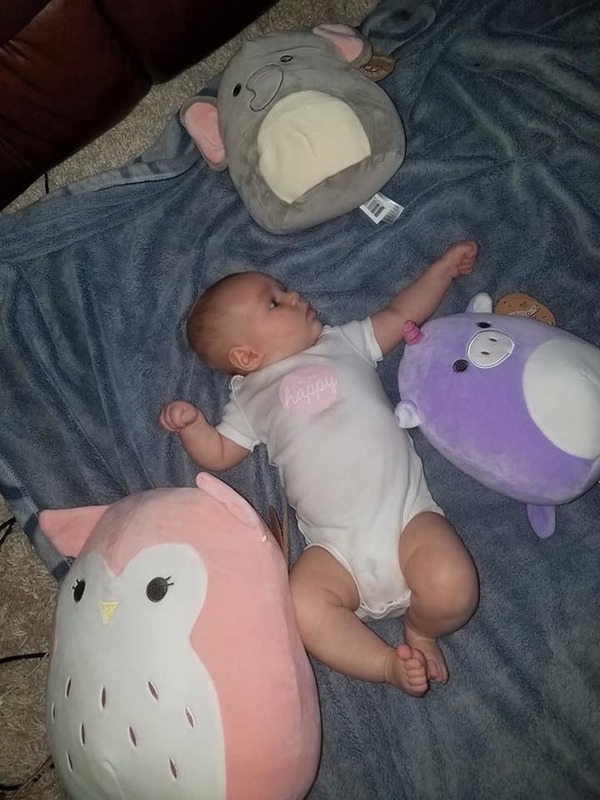 My thoughts: I was sent an adorable selection of the new Squishmallows Baby line to review for my sweet three month old baby grand daughter, Reylin Elaine. She is just so precious. I showed her the toys and let her feel them with her pudgy little hands. She was smiling such a beautiful bright smile! Her entire face just it up! The darling elephant and the unicorn make rattling noises when you shake them, and Reylin loves that! The Squishmallows are the softest and highest quality plush pillow toys I have ever felt. These will be enjoyed for many years to come! Caring for Squishmallows is easy: give them lots of love, wash in warm water and tumble-dry on medium heat. 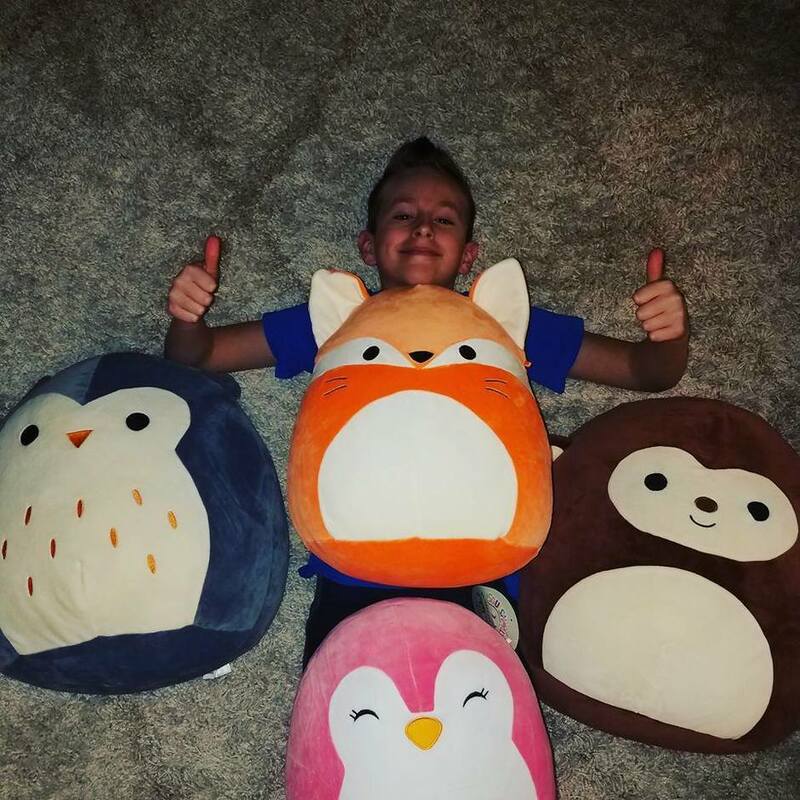 Customers who sign up for the email list at www.squishmallows.com are the first to know about new products and get an exclusive opportunity to win prizes. Squishmallows are available at national retail chains, gift shops and online at squishmallows.com . For more information, visit squishmallows.com . Join the squad online and follow @Squishmallows on Facebook, Instagram, Twitter, Pinterest and YouTube. My son, Braxton is eleven years old, and still has problems sleeping at night. It doesn't take much for him to 'show up' in my bedroom at any given time of any given night. It might be that he had a scary dream, but most likely, a scary thought of some sort. Braxton is a deep thinker. 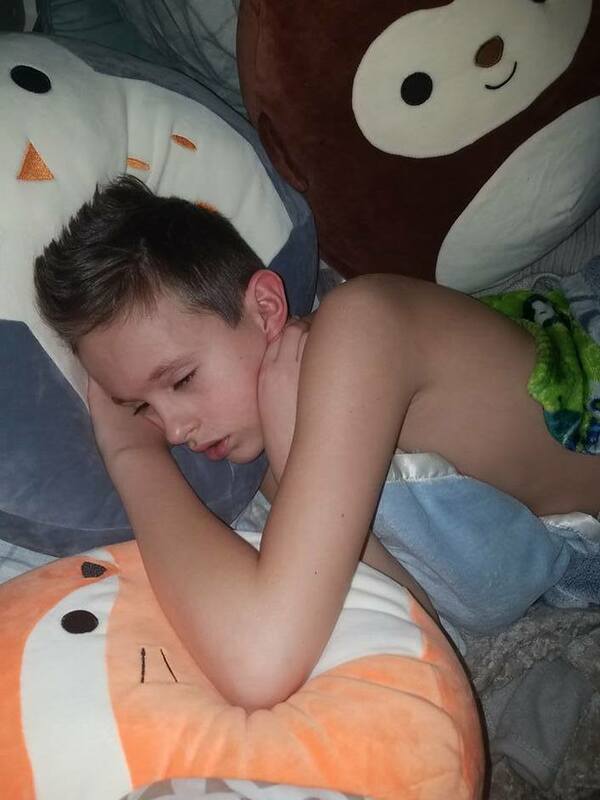 I was thinking about getting him some sort of a comfort pillow that he could cuddle with during the night when he is frightened, and thankfully I got the chance to review Squishmallow plush toys. Since 2017, the Squishmallows™ collection has offered comfort, support and warmth as a couch companion, pillow pal, bedtime buddy and travel teammate. 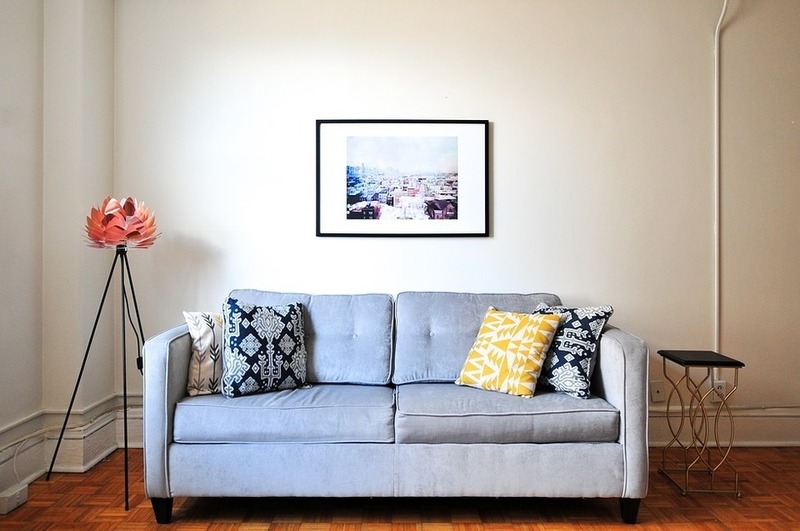 No need to feel alone, you’ll have a buddy for the movies, the bedtime stories, the laughs and more! Each character has its own name and its own little character description on the Squishmallows website. You can even register your Squishmallow to become an exclusive member of the Squishmallow Squad! Braxton's Squishmallow pals have already gone camping at the beach with us! They make the most perfect road trip companions because they are the perfect size, shape and softness to lay your head on in the car as you travel. There is just something special about Squishmallows. I feel as though they were made with love. Braxton has been sleeping with them every single night. They have replaced his normal pillows because of how soft they are. Squishmallows are available at Walgreens.